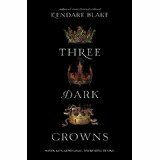 Kendare Blakes Three Dark Crowns has been one of the highlights of my reading year so far. Therefore I am pleased to present the interview with her. We spoke about the book series, the world it is set in, about movie options, One Dark Throne – and the subsequent books 3 and 4! In other interviews you talked a lot about how bees inspired the idea for Three Dark Crowns. What inspired the different talents of your queens? How did you decide which ones would be best fitting for your story? I had always wanted to work with poison (was fascinated by Mithridatism and the tale of Queen Elizabeth and the poisoned dress), but never had quite the right story. So when these queens showed up with their gifts I knew that one of the gifts would be the ability to ingest and administer poison. As for the naturalists, I always love to write animal characters. And for Mirabella’s elemental gift, I knew she needed to be a powerhouse, and being able to throw lightning seemed appropriately badass. The other gifts—the war gift and the sight gift—filled in with time. Have all queens gifts which differ from each other per generation or have their also been for example three poisoner queens in the same generation previously? There have never been three of the same born but there have been two. Two elementals is probably the most common variation of that. To give readers who didn’t read the book yet a feeling about what awaits them: Which color(s) and which key word(s) would describe the atmosphere of your novel best? I’ll do three of each. For colors: Black, orange and green. Key words: manipulation, competition, loyalty. What do you like most about your main characters? And which one was the hardest to write about? Mirabella was definitely the hardest to write about. It was easy to dislike her just because she seemed to have it all figured out. But once I got to know her, and understood how deeply she loved her sisters, and the internal struggle she had between loyalty to them and duty to the island, I came to adore her. Arsinoe and Jules go hand-in-hand, and their arc and their friendship was one of my favorite aspects to explore. Katharine was probably the easiest to write about, because I found the poisoners very easy to write about in general. And her journey from victimized pawn to scorned combatant was lovely to see. Which secondary character did grow on you unexpectedly? She was meant to be a very minor side-character, but she just kept inserting herself into scenes, and ended up becoming one of Mirabella’s closest friends. I’ve just found out that you expanded your novel series from 2 books to 4 books. Will book 3 and 4 be a continuation of the story of Mirabella, Arsinoe and Katharine or will these be prequels or something different? Both? We’re going a bit deeper into the island’s history, and into the bloodline of the queens. But the story arc of 3 and 4 will still be a direct sequel to the arc of 1 and 2. 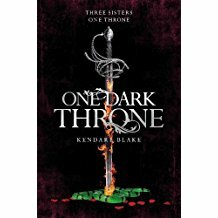 The survivors of One Dark Throne will continue on to try and survive 3 and 4. I think of the series as two duos: Three Dark Crowns and One Dark Throne are the duo of the Ascension Year, and 3 and 4 (titles to be revealed) are the duo of the reign. 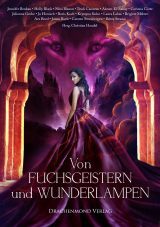 I am always looking for lgbt-characters in fantasy novels and blog often about this topic. 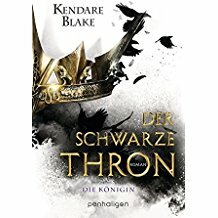 Therefore I wonder: Will we see some (open) queer characters in the sequels to THREE DARK CROWNS? Female-female relationships are common in certain circles on the island, for instance within the temple, and within war-gifted society they have something called blade-women, who are close companions in arms and are also in a strong physical relationship. Sometimes they function as second-spouses. Some of that will feature within the third and fourth books, but I’m not sure yet to what extent. I tend to let the characters work that out on their own. Male-male relationships are also present of course, but they are less common. I suspect that Arsinoe and Jules’s friend Luke is gay, but he’s not out enough to tell me for certain. You named your cat Tyrion, so I assume you’re a Game of Thrones fan. Would you recommend your novel to GOT-fans and in which way differs your novel from his works? 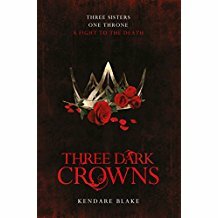 Since I do love Game of Thrones, it would be great if GOT fans enjoyed Three Dark Crowns. They do share some similar elements: a struggle for a throne, betrayals and unexpected twists, a cast of varied and manipulative characters. But they also differ in many ways. 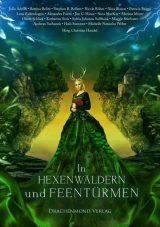 Three Dark Crowns is contained (well, for now) to the world of Fennbirn Island, and it is intensely matriarchal. There are no dragons, to my great dismay, and also no Khal Drogo. What was I thinking? How excited are you about the movie option? To which degree will you be involved and can you tell us any news about it? I am EXTREMELY excited about it! I have no news to share as the option is still very new, but I have spoken to a few of the execs/producers with Fox and 21 Laps and they are awesome. I’m sure they will make a fantastic film and I don’t intend to get in their way. 21 Laps’s STRANGER THINGS and ARRIVAL were two of my favorites last year, so I couldn’t be more thrilled that they are on board. What excites you most when you start a new novel? Finally writing down the story that’s been clanging around in my head for the last few years. That’s usually how long it takes before I’m ready to put pen to paper (or rather, fingers to keyboard). The beginning is always electric…so much uncertainty about where things might go. And that magical feeling when the words take over and the story finds itself. I love the writing most when it feels like I have nothing to do with it. Can you please give us a small teaser what awaits us in ONE DARK THRONE? And by the end of One Dark Throne, someone will be wearing a crown.